Remember that new Frank Ocean album everyone thought was going to drop about two weeks ago? Well, it didn't happen. Of course. That hype was all for naught. Only if “naught” nowadays means publicity. 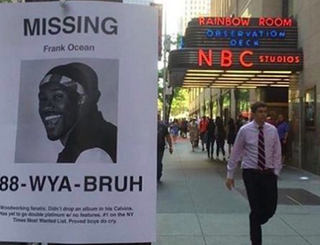 Apparently the R&B singer is missing, according to some new fliers popping up around New York City. The fliers hilariously call Ocean a "woodworking fanatic” and urge people to call 888-WYA-BRUH, which actually belongs to a company called T Marketing Enterprises. I hope that when his album finally drops, it's not a flop.